It's going to take just about every single one of us to cool the planet and we're going to get a whole lot more done if we work together to come up with the most eco savvy solutions. Cooperation, shared know-how and a whole lot of teamwork. 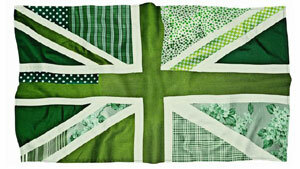 And that's the idea behind Team Green Britain day this 10th of July. Whether you're an eco warrior or an eco newby you can do your bit to help fight climate change; this really is a case of every little bit matters. • Team Energy to follow tips on cutting energy usage (and bills) in your home. Tips include getting together with friends to share the telly, insulating and boiling the kettle one cup at a time. • Team Swap to, you guessed it, swap your old stuff for new. Tips include choose quality over quantity and keeping jewellery for special occasions as producing it is quite energy intensive. • Team Big Lunch to bring communities together to share food, tales and good times. Tips include growing your own food or buying locally to reduce your food miles and slowing down to enjoy it. • Team A to B to make journeys as green as possible. Tips include ride sharing, sharing shopping trips and holidaying closer to home. • EcoTeam to help you set green goals and support each other to achieve them. A trained team leader shows you how to measure how your actions to see how they have benefited the environment and your money purse. For those that are only half sold on the concept this might be the clincher on getting you involved. If you join Team Britain you will have exclusive access to London 2012 tickets and special Olympic events. The site also has a green reads section where you'll find 60 second guides including greening the school run, counting your food miles, farmers markets, transport emissions and giving your bathroom an eco make over (our tip on this one: natural candles instead of parrafin and chemical based candles are a simple and instant way to change the feel of your bathroom at night). To join visit Team Green Britain.